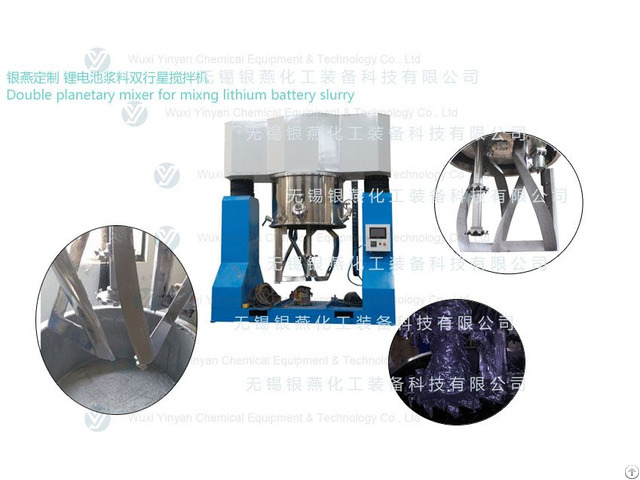 YINYAN 1000L battery slurry mixer machine, double planetary mixer is a new mixing machine with high performance, high efficiency, easy to clean and to maintain. 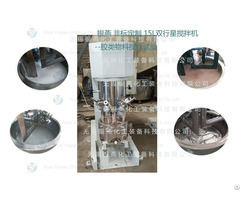 The mixing system consists of double agitators, including double low speed mixing shaft and single high speed shaft, options of scrapers.According to the viscosity and characteristics of the material, usually the mixing agitators' type including paddle type, twist type, claw type, frame type etc.. They all having good mixing, reacting, kneading, dissolving effect. The high-speed dispersing consists of multi-layer toothed disc with super high linear speed. 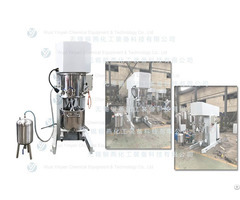 It also rotates and at the same time revolve around the axle with strong dispersing effect so that it can disperse the powder (additive) in the liquid rapidly.Options of scrapers can keep clean the inner wall and bottom, making the mixing completely, and ensure the stability of the product. Powerful double Planetary Mixer adopts planetary gear wheel drive. There is a large output torque, suitable for high temperature, high solids, high viscosity, and other difficult working conditions. This equipment is closed design, can be used with a vacuum system to realize vacuum mixing. Mixing bucket can be designed with a heating jacket, matching mold temperature controller, to realize thermostatic mixing function. 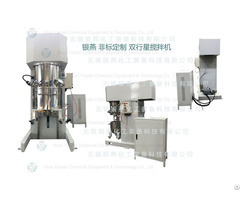 It's the first choice of dispersing and mixing equipment for the high-viscosity materials. Business Description: Wuxi Yinyan Chemical Equipment & Technology Co., Ltd is a comprehensive enterprise specializing in R&D, design, manufacturing, sales and service for both class I ,II & III pressure vessels and liquid & powder machinery. Wuxi Yinyan, established in 2010, is located in Wuxi city, which is close to East Wuxi Railway Station. It has two production bases, covering an area of more than 32,000 square meters. Our main products and services include reactors, heat exchangers, separate containers, storage vessels, dispersers, mills, emulsifiers, mixers , blenders, filling machine and whole set production line for powder and fluid production, which are widely used in industries such as petro-chemical, chemical industry, power station, pharmaceutical, coating, daily cosmetic, food, metallurgy, lithium battery, pesticides, detergents, building materials, asphalt emulsion modification, papermaking, printing inks, lubricants, dyeing and textile auxiliaries etc. Wuxi Yinyan insists on international strategy in the course of development, and continuously intensifies the efforts on international market exploitation according to market demands and its own products condition. Currently, our machines have been exported to many countries such as Europe, Southeast Asia, South America, Africa, Middle East ,etc.. Adhere to technical innovation, wuxiyinyan has established its influence, popularity and good reputation in the international market gradually. Always adhere to “ Improve Quality, Satisfy Customers, Perfect System, Exploit and Innovate” as Wuxi Yinyan quality guide line, led by the banner of Honesty, Cooperation, Learning and Innovation, Wuxi Yinyan is making great efforts to realize perfect unity of company economic benefits and social benefits continuously!